Today's blog post is part of a blog hop, where you travel from blog to blog to read diverse ideas on an assigned topic. Because it is a tarot blog hop, the topic is focused on a time when my understanding of tarot underwent a radical change or when my skill took a giant leap forward. Although all 28 blogs in the hop will speak in terms of reading tarot cards, there will, no doubt, be insights you can apply to other areas of your life. 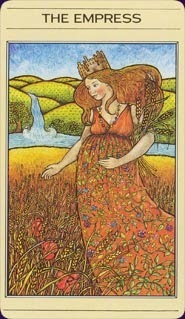 Mother, Demeter and the source of creation. within someone...whatever you see in the picture. My journey with tarot started out more than 25 years ago. At first, I wanted to learn how to read the cards so I could tell the future. 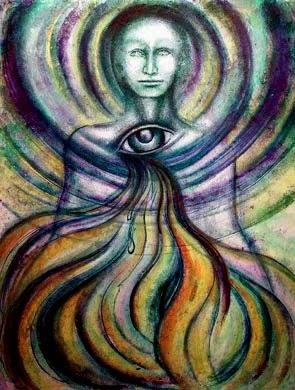 But, as it turned out, that is a naive vision of what tarot can do. It actually does much more. It brings you on a journey through issues and situations in your life and helps you make better informed decisions. Confining tarot to the narrow bounds of "fortune telling" would not be the only naive assumption I would make about this ancient art, skill and spiritual practice. As you might already know, each of the 78 tarot cards in a deck comes with a general meaning attached to it and a picture on the card. I thought all I needed to do was memorize the meanings of 78 cards and that would be enough. So I set about memorizing the book descriptions for all 78 cards and a reading from me would mean I would cough back, word for word, the meaning I read in a book about a certain card. Back then I owned maybe three decks and only used the one I memorized for readings. While that's one way to do it, I nonetheless felt stuck. Stuck, because I realized that the same card could have different meanings depending on what position it landed in a spread. I came to admire many other decks, some with meanings that didn't track to the meanings I memorized. I discovered that each card speaks in a unique language to the reader, so one person's Empress card may not be another person's Empress card. And I learned that there was a whole other use for the cards that I had never considered—as a means to access the intuitive voice within that bears knowledge beyond what is seen and known. I also felt stuck because my memorization of the cards had an unanticipated side effect—the minute I'd turn a card over, the rote meaning would immediately pop into my head as it would if I had memorized multiplication tables or anything else. So logic and learned response was my knee-jerk reaction to seeing a card. And because that was my knee-jerk reaction, any intuitive hit I might have on the card got lost. By the time you bring logic and memorized meaning in, the opportunity for your first intuitive hit is forever lost. You can't go back and get it. Only one impression can be first. So to "fix" this problem, I got a deck of what are known as Soul Cards and read them exclusively for a couple of years. Soul cards have no fixed meaning. It's just a picture on a card and you have to come up with the meaning from inside you. By focusing on Soul Cards, I was able to re-train myself—to take the intellectualization out and put the intuition in. Today my readings reflect a combination of both...intended meaning and intuitive meaning. at peace or whatever else strikes you. I can also read smudges on paper, shapes in a cloud and the inside of my eyelids, not to mention pretty much anything else you can imagine. Because that's another naive belief I dispelled over the 25 years I've been a reader. The cards themselves have no power. They have some meaning, but the real meaning and interpretation comes from within the reader. The cards only trigger your intuition, they don't give it to you. And once your intuition is triggered, you can apply it to anything...anything can trigger it. I did consider giving up when all I knew was memorized meanings. I mean, all that work and it did nothing to make me "psychic". I still teach students that it's important to eventually memorize all the meanings. You'll do that anyway if you read enough. But I stress the intuitive hit. 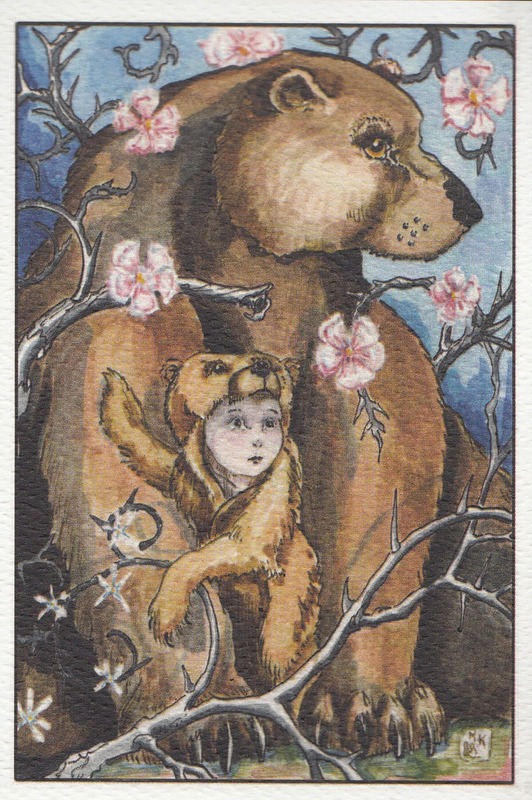 I'm amazed at how many people who have never even touched a tarot card before can accurately intuit the meaning just by looking at the picture on the card. It has never once failed in a class I've taught. Which brings me to the bigger point for my "usual" readers. I wasn't born with any special gifts. Some people are and, while they still have to work at it, they don't have to work as hard. It flows like water. No, I was born with the base-model intuition package, just like most of you. So 25 years ago I was stuck. My intuition wasn't flowing at all. Today, however, I can be pretty flowy. And whether you believe this about yourself or not, you can be too. We all have intuition. It's built into our DNA. And, just like a muscle, the more we work it, the more powerful and responsive it can be. You can learn to read tarot. You can learn to talk to dead people. You can learn to communicate with animals. You can learn to channel spirits. You can learn to have two-way conversations with God. The ability for all of that resides in your intuition and your ability to trust. Over the centuries a lot of fear has been connected with things like tarot or mediumship. Certainly it's weird to have someone SEEM to get inside your head and tell you stuff they couldn't possibly know. But whether you choose to use it in that way or not, intuition is vital to our survival. It's how we "feel" something is wrong. It's how we "sense" a person standing behind us. It's how we suspect someone is lying to us. It's an absolutely critical part of our biology that can atrophy or be built up, just like a muscle. Each of us acts as a receiver and transmitter of energy. That's why you can feel it when someone is angry or keeping something from you. Every single thought or action creates a wave of energy that can be detected. Everything is energy. So the stronger your ability to detect and read that energy, the better prepared you are to navigate the intricacies of life. For anyone who would claim intuition in any form—whether it's aided by cards or bubbles up organically from within—is the Devil's playground, I submit that being blind to your intuition is the real Devil's playground. If you can't sense him knocking at the door, you may just let him in. Awesome! You have such a knack for putting your thoughts into words. This explains things so well. I hope that anyone who is wishing to learn to read Tarot finds this post and reads it. It will light their path and give confidence to step forward on their journey. Blessed Mabon. I'm right there with you - our stories sound quite similar (and I'm sure there are many others that share the same experience!). It's easy to acknowledge the importance of intuition, but quite another thing altogether to let go and trust it. I've never worked with the Soul Cards but they look really beautiful and interesting! Thanks, Bridgett. :) Olivia, they are really nice. And there are two packs of them. Some people find them kind of dark, but I never felt that way. It was so HARD for me to get my intuition going and I'm forever amazed at how people who have never seen tarot before can get meaning. I remember when I first saw tarot cards they did nothing to inspire me. In fact, I thought they were ugly. I needed the Mythic because I could relate to mythology. Now I have bazillions of cards and love the artwork. Things change. And I'm glad they did. My first response to your post was: Yeah, but.... So I had to fall back, have some breakfast and think about it some more. I totally agree with what you are writing about the importance of trust. I guess I am lacking that at the moment: Lack in trust if my intuition and most importantly lack of trust of my unbias. Guess I am afraid that if I walk too far out from the well known meanings of the tarot cards my readings will be too biased of what I think me or the cliant wants to hear or my bias surrounding a specific situation. Something to work on these dark coming months! Thank you! I love that Stolen Child card that you have used to illustrate your story, Tierney. It's beautiful! While I do agree that intuition is hugely important, my own path involved getting a good basic training under my belt and THEN being able to trust my intuition - a bit like a chef needing to be able to make a great omelette before he goes wild with the mushroom ice-cream ideas lol! It's great that we all come at the skill of reading from different angles! I started that way too - trying to memorize everything! It was a long time before I learned to let go and trust my intuition, and for that I'm grateful for the encouragement of TABI friends and mentors! Thanks for sharing. I remembered another place where Soul Cards come in handy. If you ever read at metaphysical fairs or anywhere where the querents might have a marginal knowledge of the tarot, then having a deck they don't know can help. In a situation like that once, I spent the entire reading explaining to a woman why I was reading a couple of cards a certain way that didn't track with the meanings she memorized. It was annoying because her constant questioning was distracting me from giving her the reading she came to get. She kept wanting to reinterpret the cards the way she wanted to hear them. So, since this woman came to me every month at this same event, I started bringing Soul Cards. They're handy because, unlike most oracle cards, there are no words on them and no meanings. Anyway, she got all flustered at first because she couldn't read herself, but it shut her up and I was able to give her the reading she came to me to get. Because she kept coming, I figured it must have worked for her. "Each card speaks it's own language" is such a deceptively simple statement. :D I love it! Tierney, as other's have said, excellent storytelling and explanation of the intuition vs. card meaning balance. I actually started out with both together (Anthony Louis's Tarot Plain and Simple) and a grounding in mythological symbolism from childhood, but I did lean on the book a lot in the beginning. I also noticed, like you, that folks could intuitively see the universal human symbolism in the cards, which makes sense, or how could we give a reading? We must be dealing with a common symbolic language, image-based or word-based (and of course letters are images, too).